For the second straight year, youth is served for Varsity Sports Network’s Softball Player of Year awards. Campbell Kline put together a historic spring, propelling Severna Park to its first state championship in nearly two decades. The junior shortstop is Player of the Year. After breakout freshman campaign in 2017, Maddie Penta didn’t slow down this past spring as Bohemia Manor again captured the region’s No. 1 ranking. The sophomore is Pitcher of the Year. Meredith McAlister guided Severna Park to an impressive postseason sweep. The 10th-year coach is Coach of the Year. Kline was the record-setting table setter for the Class 4A state champions this spring. The junior is Varsity Sports Network’s Softball Player of the Year. The shortstop batted .750 with eight home runs, 39 RBI and scored 53 runs for the No. 2 Falcons (25-2 overall), who claimed their first state crown since 2003. Her 69 hits were a state public record. After an impressive sophomore season in 2017, Severna Park coach Meredith McAllister knew Kline would continue her ascend this past spring. The Falcons’ leadoff batter, Kline posted 24 multi-hit games, including a pair of triples (3 RBI) in a 13-0 rout of then-defending state champ Montgomery County’s Northwest in the final at the University of Maryland. Her 2-run single in the second inning was all Severna Park needed in a 3-1 victory over previously undefeated Chesapeake-Anne Arundel in the Anne Arundel County title match. Kline, who hit safely in all 27 games, finished with 12 doubles, six triples and a 1.272 slugging percentage on the season. Kline, who spent last season improving her speed and becoming a better all-around player, has a relatively simple approach at the plate. Kline, who batted .611 last year, has stressed opposing pitchers in her varsity career. She has 148 career hits, 18 shy of tying the state mark. The Gatorade Player of the Year in Maryland, Kline will take a 32-game hit streak into next spring. She’s verbally committed to Maryland. There was no sophomore jinx for Penta this season. For the second straight year, Penta is Varsity Sports Network’s Pitcher of the Year. 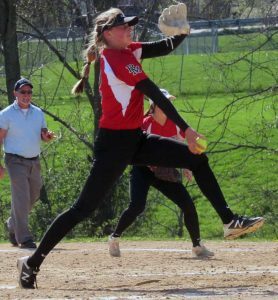 She went 15-0 with 217 strikeouts and an 0.09 earned-run average for the Tigers, who repeated as Class 1A state champion and No. 1 in the final VSN Top 20. The Cecil County school finished 23-0. Penta, who didn’t allowed a run and struck out 244 in her varsity debut last year, was more comfortable this spring. Penta, whose mother and mentor, Susan, was a varsity assistant this past spring, allowed 17 hits and walked 15 on the season. Maddie tossed a no-hitter in the Eagles’ East Region final win over Cambridge-South Dorchester. Penta was also Bo Manor’s leading hitter (.413) and drove in 27 runs. She’s 36-2 on the mound over two seasons. Regarded as one of the Top 5 pitchers nationally in the Class of 2020, Penta, the first back-to-back winner of VSN’s Pitcher of the Year award, is verbally committed to Auburn University. McAlister guided her alma-mater back among the elite in state softball this past spring. McAlister is Varsity Sports Network’s Softball Coach of the Year. Severna Park (25-2) enjoyed a Triple Crown postseason, capped with a 13-0 blowout of 2017 champ Montgomery County’s Northwest in the Class 4A state final at the University of Maryland. In winning their first state championship since 2003 (3A), the Falcons equaled the largest margin of victory in state final history (largest in 4A final. McAlister said winning a championship wasn’t necessary the goal, instead focusing more this season on the smaller picture. After losing to Chesapeake-Anne Arundel late in the regular season, Severna Park ended the Cougars’ perfect run in the Anne Arundel County league final (3-1). The Robinson Road school outscored opponents, 41-1, in the postseason. McAlister, who lost in the state softball final in her senior season at Severna Park in 1999, was happy to see her players taste ultimate success. “They got to go as far as they could possibly go and there’s no feeling like it,” said McAlister, who was assisted by Kelly Burke, Ashley Chafin, Kris Dean, Eric Sherman and Emma Yale. A three-sport standout at Severna Park before attending Long Island University-Brooklyn and Maryland, McAlister spent three seasons as a Falcon softball assistant before taking over in 2009.